Achillea millefolium, Sneezeweed, Yarrow in the wild. Yarrow, one of the common weeds found along our roadsides from mid to late summer, is also the ancestor of many favorite plants in today’s gardens. Even with many species, yarrows are easily identified by the unique pine-pepper scent of all plant parts, their tiny typically white or yellow flowers that come in either flat or convex clusters called corymbs, and their fern-like leaves. Botanically, the weed yarrow is Achillea millefolium, but is known by many common names: Milfoil, Bloodwort, Stanchgrass, Thousandleaf, Nosebleed, Old Mans Pepper, Carpenter’s Weed, Staunchweed, Dog Daisy, Goose Tongue, Sweet Nuns, and Knight’s Balm, and Woundwort. Some of the names come from the plant’s appearance; ‘Milfoil’ and ‘millefolium’ means a thousand leaves, referring to the plants finely dissected leaves. Most of the other names refer to its reputed ability to stop hemorrhage. Edwin Spencer in his book All About Weeds wrote that “this plant is about as worthless as any that grows.” This is a rather harsh review, but it is true that this naturalized European-native is very invasive and a strong grower. Some stories say yarrow received the name Achillea because the Greek hero Achilles of Trojan War fame who taught his fellow soldiers to use the herb’s leaves to stop bleeding battle wounds. 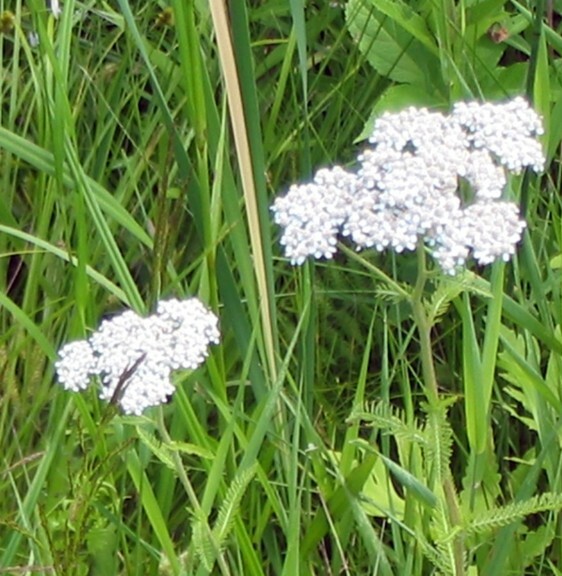 From that time right up to our country’s Civil War, yarrow was used in battlefield medicine. Throughout history there are many reports on the medical uses of yarrow, from European physicians to the Chinese, Shaker, and Native American herbalists. Some uses seem contradictory, as it was recommended to stuff the nose with yarrow leaves to both cure and cause a nosebleed. Long ago it was long thought that by inducing a nosebleed, you cured a headache. Modern archeologists have even found yarrow pollen in Neanderthal burial caves indicating man has used this plant for the last 60,000 years. Besides medicine, it has been used for amulets to protect from everything from blindness to robbers, or used as astringent and cleansing lotions, and even yellow dyes. It has also been used in black magic and prophecy. I Ching, the Chinese method of prediction used 50 dried stalks of yarrow in the casting. A European belief held that if you wanted to dream of your future love to sleep on a flannel pillow filled with yarrow. Of the eighty or so species of yarrow, only four are used as garden plants. 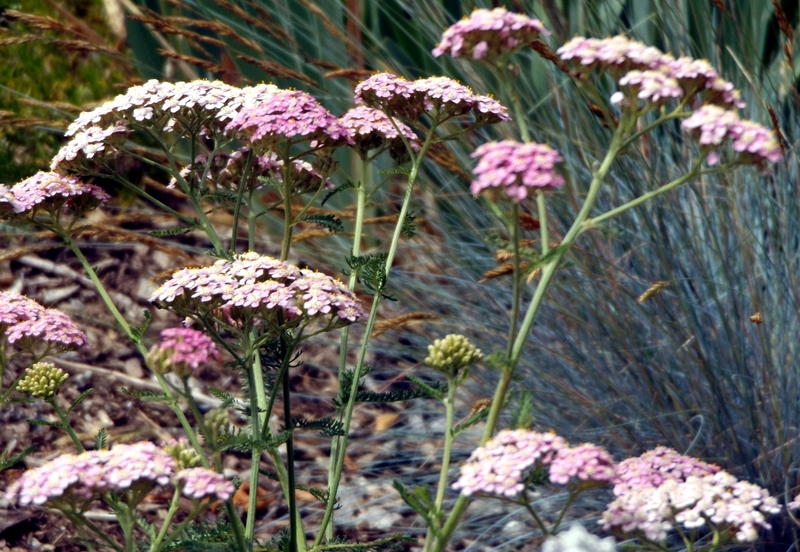 Achillea filipendulina ‘Moonshine’ is sold in nurseries everywhere. Its soft-yellow corymbs mix with nearly every other color found in the garden. It has attractive gray-green leaves, loves sun and is drought tolerant, qualities that make it a popular plant. A. ‘Coronation Gold’ and A.’Gold Plate’ are two other well-know cultivars from this genus. 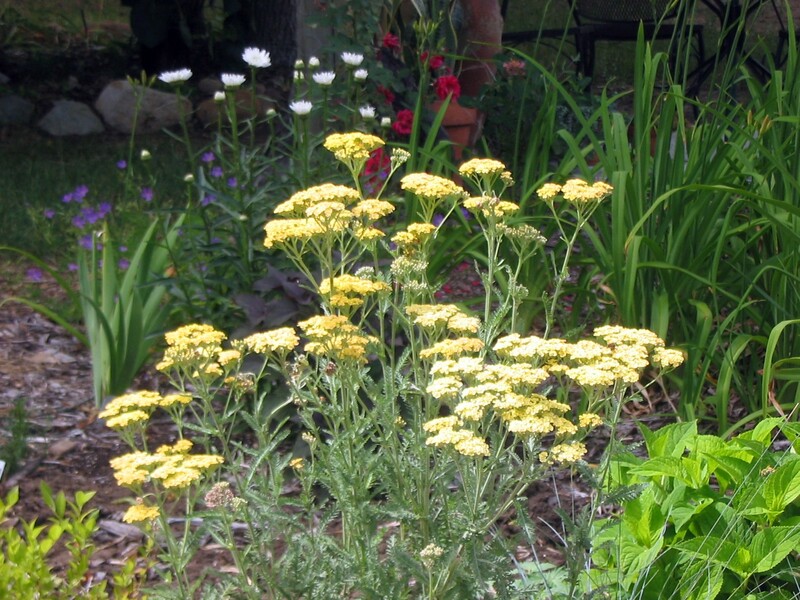 The Achillea millefolium species has come a long way as a garden plant. The original white or cream cultivars now come in pink, red, and orange. They share the drought tolerance of A. f. ‘Moonshine,’ but early colored varieties had a weedy, invasive habit and foliage that tended to get ratty-looking, which made them less desirable plants. However, within the last two decades breeders have crossed the millefolium with other Achillea genus, developing many new cultivars. The size of the corym has increased, the plants are better mannered, less raggedy; the drought resistance remains, and the colors are a wonderful range of soft pink to gingery orange. Check with your nursery for varieties they stock. Others can be found in mail-order catalogs. They are wonderful additions for any garden and a must for dry locations and water-restricted areas.